Continuing the visual countdown to the biggest move in comics since 'The Death of Superman' (when comic deaths were still rare), here's an amazing splash from artistic wizard Moritat and All-Star Western #1. While I admit this title was originally on my pass list, now for some reason I am currently craving western based film, comics and novels, so a good dose of Jonah Hex fits right in. Hopefully DC gets a few more super-hero alternatives up and running. 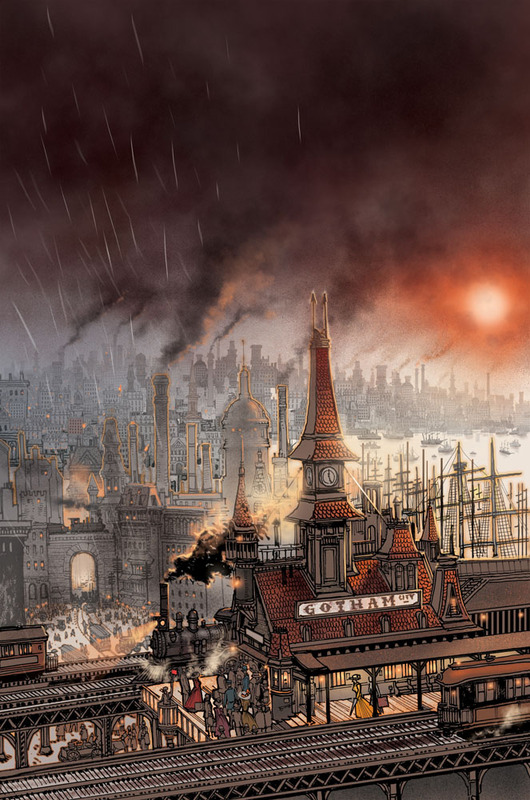 With art like this - of a pioneer Gotham City - it shouldn't be to hard! For more of Moritat's art (real name Justin Norman), click the jump. I agree, this looks great; but I'm so unhappy about the Titans I can't really enjoy any of this. I feel that they've gutted my favourite franchise. I love the idea. Maybe I'm just itching for Bioshock 3's release, but I really love that skyline. Thanks for the comments guys - I had the same feelings about the JSA ToB, but yesterdays news sorted that out - now I'm excited to read earth-2 adventures all over again. I saw the bioshock stuff researching this post Craig - really nice. Have you collected it all so far?